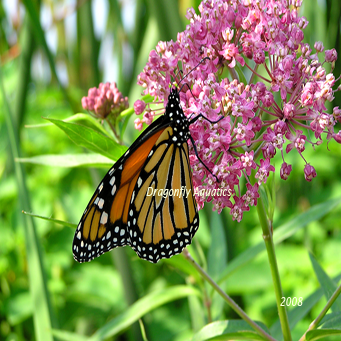 Pink Butterfly Flower (Asclepias incarnata) Butterflies and hummingbirds are attracted to the fragrant pink clusters of flowers. Grows 24″ to 36″ high and will spread to 24″. It will tolerate moist soil up to 5 inches of water. Does best if left in the pond during the winter.